January 24, 2019 – It was one of the rituals of my childhood: every winter I would keep begging until my parents bought tickets for the Circus Krone. We always got front row seats, right there at the edge of circus ring, where you would feel the arena’s sawdust on your face. I loved them all, the artists, the clowns, the ringmaster with his tailcoat and top hat, the princess on her white horse. To this day, whenever I smell the distinct circus scent, I am once again that little child spellbound by the rhythm of circus music. Switzerland. 20 francs 2019. Centenary of the Circus Knie. By Remo Mascherini. Silver 835 / 20 g / 33 mm / Mintage exclusively in proof quality: 5,000 / Date of issue: January 24, 2019. 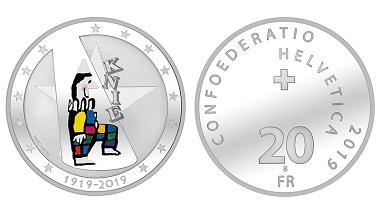 It is almost like Swissmint fulfilled a very personal wish of mine when they decided to issue a commemorative coin celebrating the centenary of the Swiss national circus Knie, which has already brought sparkles to the eyes of millions of children. Mintmaster Marius Haldimann came up with something special for the design of this coin: the 20-francs piece has not only been struck, but also partially colored by way of pad printing, which results in the clown at the center of the coin standing out against the surface of the coin in proof quality. 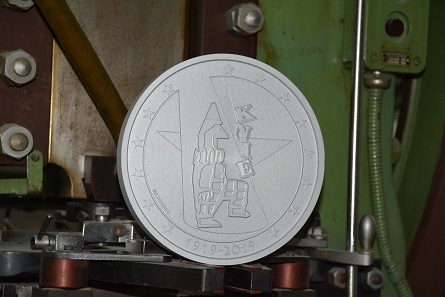 This is the first time this technology was used for a Swiss commemorative coin. Hence, it is Switzerland’s first colored coin! And that is not the only thing that’s special about this piece. You might be surprised to hear this, but circus-related images are an absolute marginal phenomenon in numismatics. Is it possible that the circus and its artists as a “wandering people” are still not considered an ordinary part of society and therefore they supposedly don’t represent a state adequately? A quick research of the relevant Krause catalogs reveals: while the clownfish, thanks to “Finding Nemo”, invariably swims through the ocean of contemporary numismatics and remains a recurring coin image, there really is only one other existing depiction of a human clown on a coin: it was issued in 2014 on behalf of Fiji as part of a small series titled “Circus History”. These were also the only other coins ever to be dedicated to the circus. 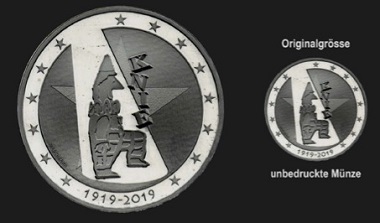 The fact that a coin like this one was possible in the first place is a sign of the openness of Swiss society and its close emotional connection to its “national circus”. By the way, this is not the first time the Knie family has been in involved in numismatics. One of their members created an image which was seen on a coin by Equatorial Guinea in 1996. It is a fairly cheaply made series that was actually dedicated to Swiss stamps. One of them features a circus image designed by Rolf Knie. The opening show of Circus Knie on June 4, 1919. © Circus Knie. But let’s begin with a bit of circus history. It all started with an improper affair between a med-school student and a trick rider. Friedrich Knie (1784-1850) fell in love, eloped, and got a taste of the exciting world of the circus ring. He became a tightrope walker and established his own company – without the aforementioned trick rider, by the way. Equipped with one rope, a few benches for the audience and a lot of faith in God, several generations of the Knie family toured Germany, Austria, and especially Switzerland, which became a new home for them. On December 26, 1900, they were granted Swiss citizenship in the canton of Thurgau, which was even more difficult to obtain back then than it is today. And then the First World War broke out. Even though Switzerland was not a belligerent nation, its borders nevertheless had to be defended. Many families were missing their breadwinners and food was becoming more and more expensive. Switzerland was heavily dependent on imports, after all, and those did not cross the borders anymore due to the war. This resulted in hunger and skyrocketing prices for the few Swiss items available. The weakened population was an easy prey for the Spanish flu, which killed more people worldwide than the entire First World War did. Hardship and fear, combined with social tension – in such times people are very grateful for any opportunity to forget their worries for a few hours. Circus Knie offered just that and the brothers Karl, Eugen, Rudolf, and Friedrich made good money with it. In order to take advantage of the economic situation, they took an additional risk. 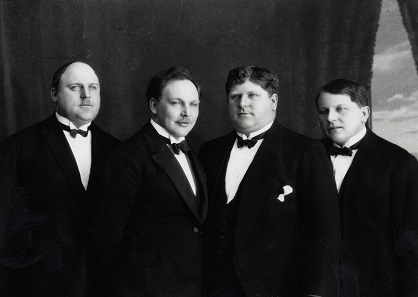 The Knie brothers – Karl, Eugen, Rudolf, and Friedrich – in 1919. © Circus Knie. Against their mother’s advice, they took out a loan and bought a tent in 1919 that could sit 2,500 spectators. The first show took place at the Schützenmatte in Bern on June 14, 1919. 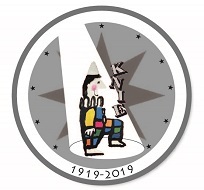 This is the reference date for the issuance of the commemorative coin “Centenary of Circus Knie”. Large crowds are said to have flocked to that first show at the roofed venue. Supposedly, visitors simply overran the small wooden hut where tickets were sold. Within just two months, the brothers were able to pay back the borrowed money. And why is Knie the national circus of Switzerland? The very same year, the Knie brothers registered their company as “Cirque Variété National Suisse Frères Knie”. That was still possible at the time. It wasn’t until 1937 that a regulation was passed prohibiting attributes such as “Swiss” and “National” to be used by private companies. That is the reason why Circus Knie is the Swiss national circus, despite having no relation to the Swiss state in any way. On the other hand, that also means it can’t demand any state subsidies. The 1920s were the golden age of revue, variety, and the circus. It was a time when entertainment happened on-site and live. Circus Knie also benefited from that. The convoy of artists included more than 80 trailers. They were transported in a chartered train of 42 wagons. In 1934, the owners transformed the family business into an Aktiengesellschaft (i.e. incorporated company), which raised the necessary funds for modern themed shows like the ones that were popular in the U.S. The same year saw a very successful water-themed tour. In 1935, more than 50 Indian artists were flown in for a revue titled “India”. The show flopped, which was a financial disaster! It took a long time for the company to recover financially. Circus Knie today. © Circus Knie. The Second World War did not hurt the circus, it actually benefited it. Once again, many people were happy to get the chance to forget their worries for a short while. And Switzerland maintained neutrality. The best and most successful artists in Europe competed for the chance to perform in a neutral country. Hence, Circus Knie emerged financially sound from the Second World War. In 1956, it purchased its solidly constructed winter quarters in Rapperswil. The iconic poster of the Swiss circus which inspired the design for this coin, was created in the same year. 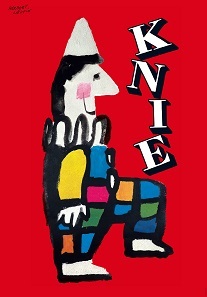 A promotional poster for Circus Knie, designed by Herbert Leupin. Photo: Swissmint. The artist Herbert Leupin was responsible for the design of the poster. At the time, he was a busy graphic artist who designed posters for some of the most famous brands. In 1956 alone, he drew advertisements for Coca-Cola, Pepita, Café HAG, as well as the car manufacturer Renault and the stationary manufacturer Paper Mate. They require only a few colors and place the central image in the spotlight. In art history, this style is generally referred to as “Magic Realism”. The most well-known of his posters is the one he designed for Circus Knie. It was a stroke of genius, a graphic play with the word, its meaning, and juggling – one of the typical activities circuses are known for. 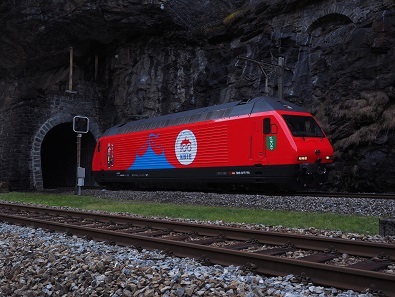 A SBB locomotive features a celebratory paint job. © Swissmint. Nowadays, Circus Knie with its 200 employees is one of the most important travelling circuses in Europe. It requires two chartered trains and countless trucks to transport all of the artists, props, and animals from one place to the next one. Circus Knie is still a family business and the younger generations are playfully introduced to the circus ring from the age of 4 on. And just like many other traditional entertainment businesses, it also struggles with financial difficulties. New forms of media are a fierce competition for people who offer peak performances to a live audience every single day. Hence, the new tent Knie purchased as its own birthday present required the financial support of Crowdfunding. However, the fact that Swiss people love their circus is proven by the fact that 498 circus fans compiled the necessary amount of 254,101 CHF within four months. 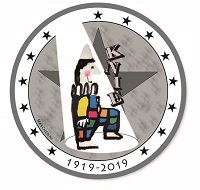 The model for the colored coin “Centenary of Circus Knie”. © Swissmint. The commemorative coin “Centenary of Circus Knie” is sign of appreciation and gratitude Switzerland extends to those people who consider it their raison d’être to offer others a few joyous hours, even though the reality of the circus world is very different from the glittering world that enchants visitors. The alternative design for the coin’s obverse. © Swissmint. This time, a Swissmint employee was responsible for the design. Remo Mascherini (*1958) has been working as an engraver at Swissmint since 2013. He put Herbert Leupin’s poster onto the coin. But he did so on a computer first. The final design of the coin which was then realized. © Swissmint. Nowadays, coins are designed on a screen with the help of a CAD/CAM system. The computer then calculates data sets which serve to either directly make the dies or, as it was done in this case, a model, which allows for the addition of details to the three-dimensional piece of art. The colorless coin. It will be available as an essay later this year. © Swissmint. Which is why Switzerland’s first colored coin is already fascinating even before the print has been added with pads. Those who prefer this piece will be able to purchase the colorless silver coin in a small mintage as a trial piece at some point this year. Once again: the finished piece. © Swissmint. Swissmint expects a high demand altogether. After all, every collector knows that the “first” coins are very often the ones that tend to increase in value. The mintage of 5,000 pieces is set very low, especially because the coins are minted solely in proof quality. No additional coins in the quality “uncirculated” will be issued. The commemorative coin “Centenary of Circus Knie” is not part of the Swissmint subscription service. It has to be ordered individually and only 5 pieces can be purchased at once. German customers can get their hands on the coin during the World Money Fair in Berlin or Numismata in Munich – while supplies last that is. Swissmint will be present at both coin conventions. The best opportunity for Swiss collectors to buy this coin is the Basler Münzenmesse on February 9 at the Congress Center in Basel. All Swissmint coins can be ordered online on the mint’s website. Some additional information about the federal mint is available on CoinsWeekly. 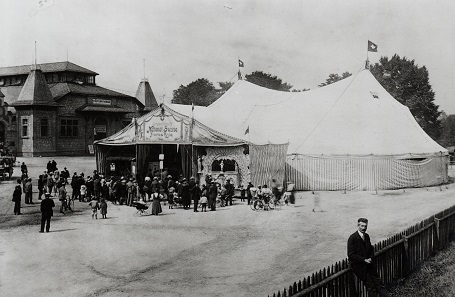 A detailed article about the history of Circus Knie is available on Circopedia. The famous Circus Knie poster and numerous other works of Herbert Leupin can be viewed on his website. This video shows you some of the highlights of the 2018 tour of Circus Knie. And in case reading all of this has made you want to see Circus Knie for yourself, tickets can be purchased on Ticketcorner.ch.